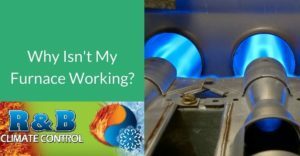 How to identify problems with your furnace It’s Winter, and even with this year’s mild winter we’ve already had a few cold snaps and freezing temperatures. If your furnace stops in the middle of winter, you don’t want it to stay down for very long. Especially if it’s something that you can take care of yourself. There are two very basic types of problems with a furnace. The first is that it won’t turn on at all, and the second is that it won’t function properly when it is on. Whether you want to call them signs or problems, today we have the 3 most common ways for you to tell that something has gone wrong. The single most obvious problem with a furnace is that won’t even turn on. Whether you fail to hear the fan kick in, the sound of energy running to the blower motor, the noise of gas to the furnace, or the roar of flames from the furnace itself, a dead furnace is just that: dead. Common problems come from the thermostat, lines, circuit breaker, and pilot light. #1 you should check is power. Examine your circuit breaker box and make sure the circuit breaker labeled for heating hasn’t been tripped. If it has, reset it. You should also check to see if your furnace has an emergency cut-off switch at the furnace and make sure that isn’t turned off. #2 Check your thermostat. Is it set properly? Is it correctly reading the room temperature? If the answer is yes to both questions the thermostat may be broken. It could be a switch issue or it could simply be failing to send a control signal to your furnace. Either way it should be replaced. If the thermostat is working and you’re simply receiving cold air, then you likely have a furnace problem. #3 Finally, check the pilot light and fuel source. If you have an electric furnace there could be a problem with the heating element. If you’re getting cold air, it’s because there’s nothing to heat it. Sometimes you’ll find that the fan kicks on but the system only seems to deliver cold air. If you can, check the pilot light to make sure it’s on. If you hear the sound of fuel but don’t see a pilot light, shut down your furnace and call a technician immediately. If the pilot light is active but you still aren’t getting heat call us. Problems with the pilot light and fuel systems should be worked on by a professional. Of course, there are other signs you should be on the lookout for are: strange smells or sounds that, when the furnace is running can hint at further problems. If your furnace itself is beeping or making noise, then it definitely needs your attention. While we always hope that nothing will go wrong, it’s nice to know you have professionals you can count on. Give us a call at (803)547-2055 for any of your heating and AC service needs! Call us 24 hours a day, 7 days a week to answer any questions you might have. This entry was posted in R&B Climate Control on February 19, 2016 by heather.